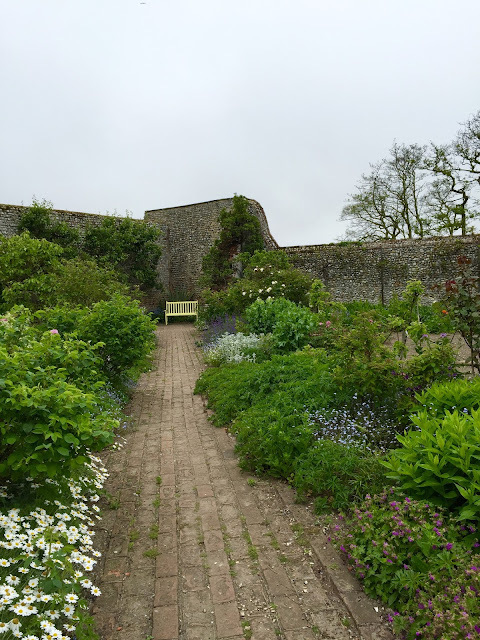 Wiveton Hall walled garden is without doubt one of my favourite places. It is somewhere I bring beloved visitors from Russia. 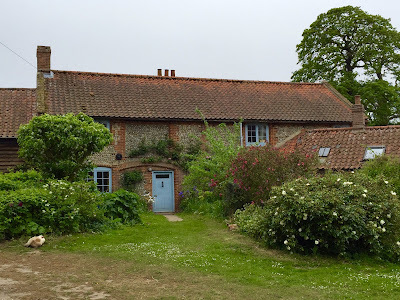 It's been open to the public since the cafe opened 9 years ago, and now with the runaway success of Normal for Norfolk, will be visited as never before. 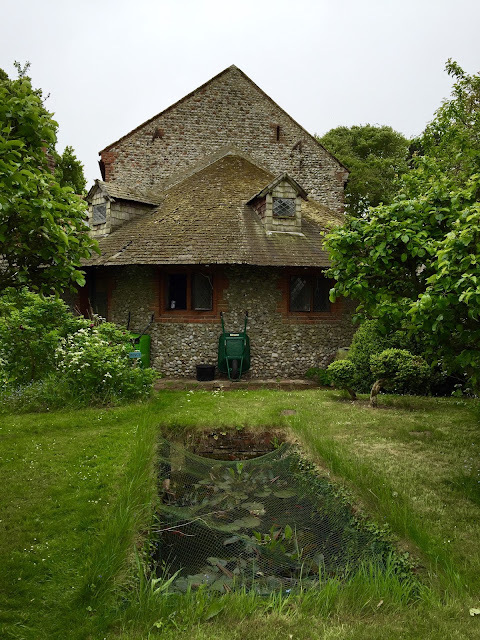 I went there on this misty bank holiday weekend, and it still feels magical and remote. Until I was 17 we rented Dairy Cottage where Desmond’s Aunt Chloe now lives, for our summer holidays. Can there be a better place for children to run wild? The walled garden was somewhere we particularly liked to explore. We ate mulberries from the tree and played cards in the apple house in the middle of the night. Desmond had just branched out into soft fruit and the garden was still Aunt Chloe’s territory. Aunt Chloe, now famous thanks to Normal for Norfolk, has fingers as green as they can be. The garden was wilder then, as only she was gardening it, and utterly beautiful. It is still beautiful, but more professional - with flowers laid out in rows for the tables in the cafe, and vegetables. 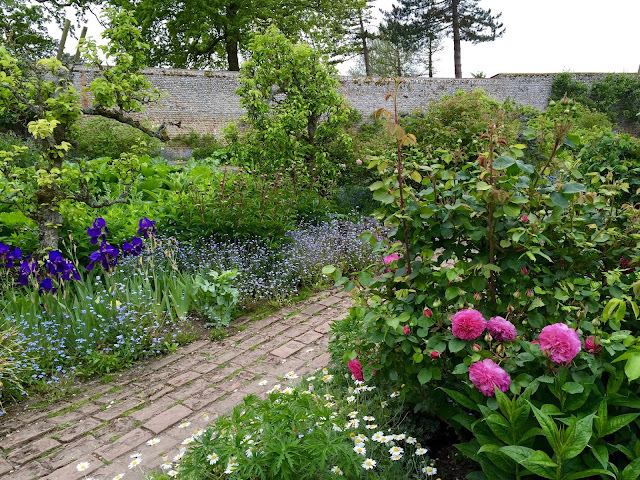 There is now a peony walk which is worth arranging one’s visit around (they will flower in June), and a herb area. The walled garden has a puzzling shape - a triangle or wonky rhomboid - however if you look at the ground plan of Wiveton Hall from above it forms a corner. See below the great painting of the Hall and its grounds by Desmond's sister Mary. The north facing wall is high at its west end - this is because after the 1953 great flood, when it was flattened, it was rebuilt at a lower height. 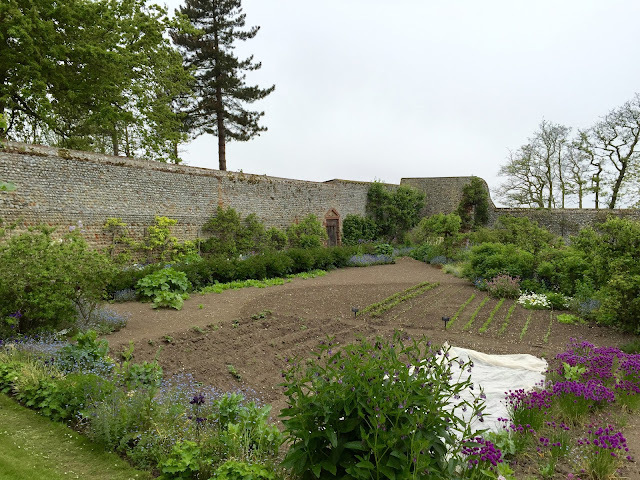 Desmond pointed out to me that the wall had been rebuilt using concrete rather than lime mortar, and that whoever built it was paid for the job rather than by the hour as it all went up at once rather than in courses as the other walls are. The work is less fine but interesting to look at in contrast to the other walls. Behind the great walls are flat saltwater marshes that stretch a mile to the North Sea. These walls create a microclimate that protect everything within from the harsh northern winds. This manmade miracle has created a secret world that Desmond, his mother and now his team, have preserved and enhanced over the years. As Desmond said in Normal for Norfolk 'some people grow christmas trees in their walled gardens; I wanted to try and keep it as a garden.' Although labour intensive, the garden provides for Desmond's table, the cafe, and the shop. Desmond’s father was playful - when he rebuilt parts of the wall, Desmond points out to me, he would insert some older masonry into the walls to strengthen it. Flint and lime walls are not strong enough alone - some strengthening is necessary - either bricks or pieces of masonry. This, his father would say gleefully, will confuse future architectural historians! 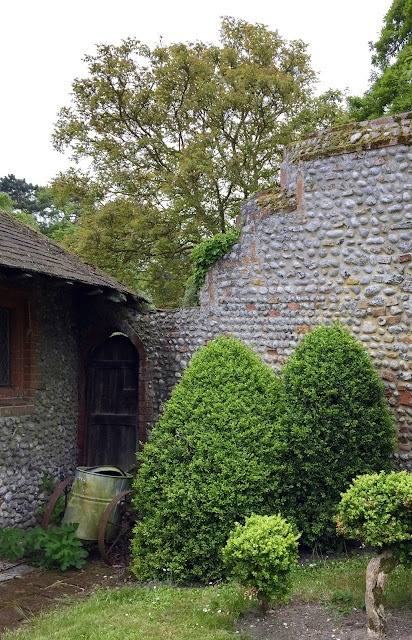 Norfolk is full of churches and former monasteries and finding pieces of masonry on the wayside was common when Desmond was a child. 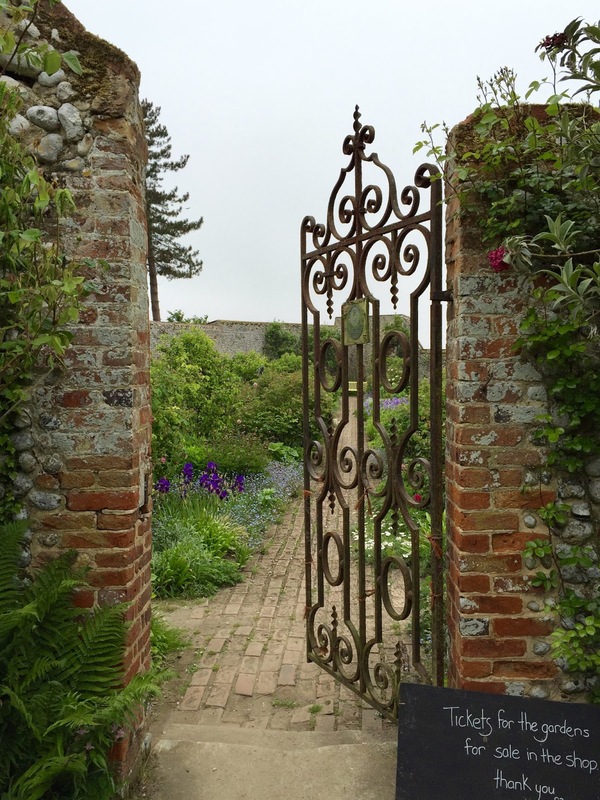 In Edwardian times the brick path was built from the gateway creating a walkway through the garden. At this time the Hall had been bought by some wealthy Edwardian shipping merchants - and the 17th century Hall was extended, beautifully and subtly in the same style, in 1908. This brought it closer to the kitchen garden and at the time it was fashionable to make the kitchen garden a feature of the grounds, thus the brick walkway was constructed - for the perambulations of edwardian ladies in long skirts. 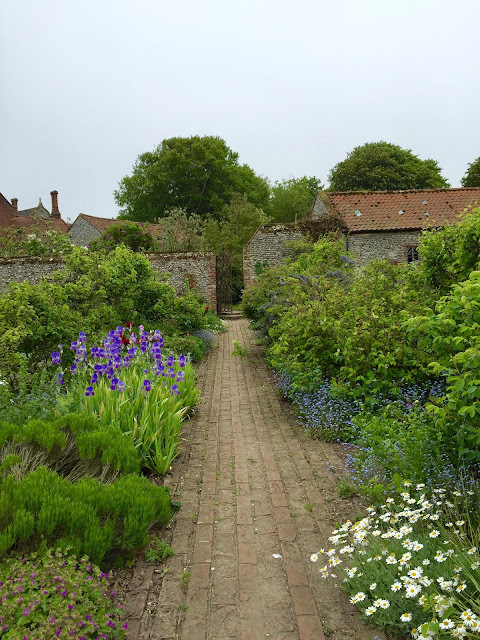 They would walk between flowerbeds full of roses, sweet peas and lavender, lined by espaliered pear trees and sit at a bench beneath the high buttress. It is still a wonderful place to sit. Dairy Cottage, where we used to spend summers. The shuttle and the egg: a Russian Easter blog.